Another lovely summer salad, which has the handy additional factor in that it can almost entirely be made from store cupboard ingredients! My mother makes this quite regularly, but I suspect that it originates from my aunt in Rome, however I'm not entirely sure. As with the Greek Salad, it's worth soaking the onions beforehand to remove a little of their pungency. 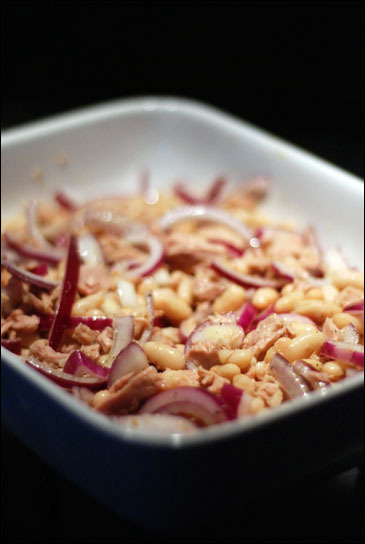 Drain the tuna and cannelloni beans and scatter across a large salad dish. Slice the onion and soak in lukewarm salted water for 10 minutes. Then drain and add to the tuna and beans. Season with salt and pepper, then pour over the olive oil and lemon juice. Toss to distribute all the flavours evenly, and serve. sorry- cannellini- the spell check automatically changes it to cannelloni. how strange!